Welcome to Little Red Robin Co.... 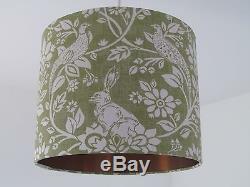 Listed here is a handmade fabric drum lampshade / lightshade with a hare and pheasant design in moss green. 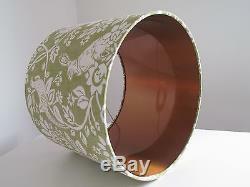 The lining has been lined with a metallic brushed copper vinyl. As all shades are handmade to order and each one is completely unique and may differ to that shown in the photographs. 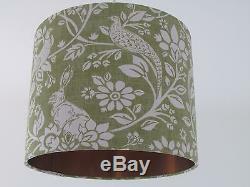 20 cm - perfect for bedside table or a small sized room as a ceiling fix. 25 cm - a little in between! 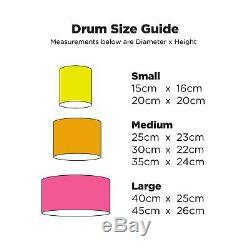 Will suit medium lamps and medium sized room as a ceiling fix. 30 cm - by far the most popular! 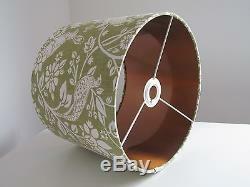 Supplied with a European converter ring and low energy light bulbs recommended. 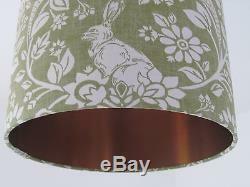 The item "NEW Handmade Moss Green Hare Pheasant Drum Lampshade Lightshade Brushed Copper" is in sale since Tuesday, August 8, 2017.